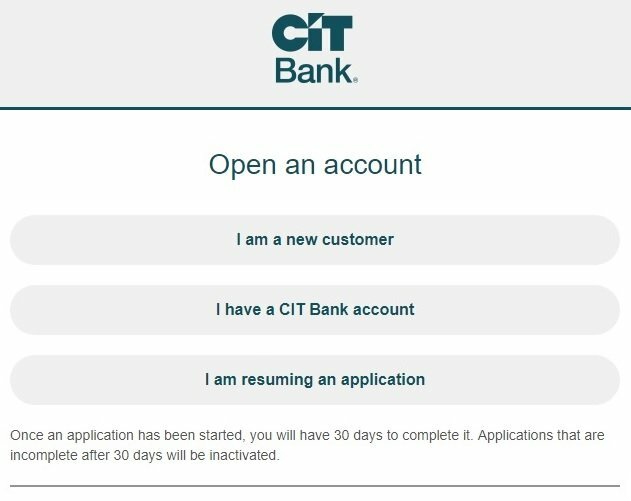 When I saw the interest rate offered on CIT Bank’s Savings Builder accounts, I knew I had to open an account. 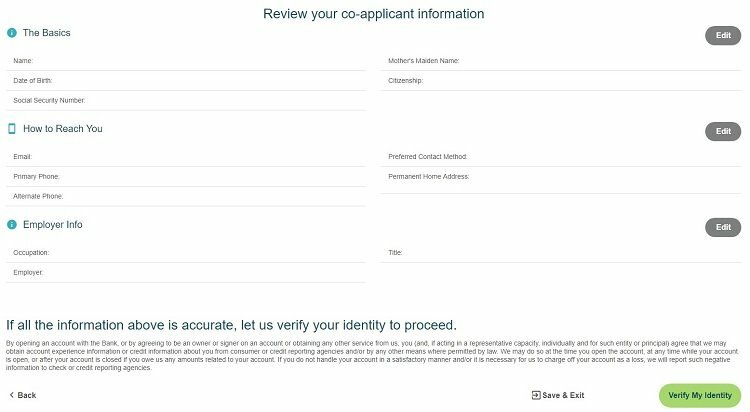 Now that I’ve opened an account, I wanted to share my Savings Builder account review with you so you can earn crazy interest rates on your savings, too. Currently, CIT Bank offers one of the highest interest rates available on a savings account with their Savings Builder account, as long as you meet their minimum requirements. While most banks require you to have insane amounts of money to earn the highest interest rate, Savings Builder doesn’t work that way. You can qualify for the highest Savings Builder interest rate by keeping $25,000 or more in the account, but you can also keep the Upper Tier interest rate by saving consistently. All you have to do is make a $100 deposit into your Savings Builder account each month by their monthly deadline to keep the Upper Tier interest rate. More on that later. Before we dig more into the account, let’s address the elephant in the room. You probably haven’t heard of CIT Bank. That’s okay. I’ll explain. CIT Bank is a major US bank that’s part of CIT Group Inc., which has been around for over 100 years. On the personal banking side of things, CIT Bank offers money market and Savings Builder accounts as well as certificates of deposit and fixed-rate mortgages. CIT’s bank accounts are FDIC insured, which means your deposits will be insured up to $250,000 per depositor for each account ownership category. In addition to personal banking, CIT also offers business and commercial banking services like equipment financing and working capital loans. So why haven’t you heard about CIT Bank before? Unless you deal with business financing on a regular basis or have been looking for a high yield savings account, you probably wouldn’t have come across them. CIT Bank is an online bank which means they don’t have any CIT Bank physical locations. Even though CIT is a major bank, they don’t offer typical personal banking services, like checking accounts, online. For that reason, CIT Bank is best for savers that are looking to earn a high interest rate on their savings. Savings Builder is CIT Bank’s high interest rate savings account product. The account offers two tiers of interest rates. Savings Builder really shines with their Upper Tier interest rate. It’s one of the highest interest rates available on a savings account. The Base Tier interest rate is still higher than the vast majority of brick and mortar banks. All savers will get the Upper Tier interest rate from the date their account is open until the first Evaluation Day. More on Evaluation Day in a second. After that, you’ll have to qualify to earn the Upper Tier interest rate. You can get the Upper Tier interest rate in one of two ways. First, you can maintain a balance of $25,000 or more in your account. This won’t be easy for most people, so CIT Bank offers another way to earn the Upper Tier interest rate. If you don’t have $25,000 to keep in the account, you can earn the Upper Tier interest rate as long as you make a $100 or larger deposit at least once per Evaluation Period. It’s important to note, your deposit has to be a single deposit of $100 or more to count. You can’t make two $50 deposits to earn the Upper Tier interest rate. Evaluation Day is a really confusing concept. I couldn’t get my head around it until I read an example, so I’ll share both the technicalities of how it works and an example. Evaluation Day is the day CIT Bank checks to see if you met the requirements to earn the Upper Tier interest rate tier for the following Evaluation Period. Evaluation Day is the fourth business day prior to the end of a month. An Evaluation Period begins the day after an Evaluation Day and ends at 4:00 PM PT on the next month’s Evaluation Day. On Evaluation Day, CIT will check to see if your account has an end-of-day balance of at least $25,000 or there has been at least one deposit of $100 or more that posts to the account during the Evaluation Period. If you meet either of these conditions, you’ll earn the Upper Tier interest rate. If you don’t, you’ll earn the Base Tier rate. Then, next month the process will happen again and determine the interest rate tier you’ll earn for the following month. Your first Evaluation Day will take place at the end of the first Evaluation Period after you open your account. Your first Evaluation Period will begin on the first business day of the month after you open your account and ends at 4:00 PM PT on the next month’s Evaluation Day unless your account was opened on the last two business days of a month. For accounts opened on the last two business days of a month, the first Evaluation Period will begin on the first business day of the second month after account opening and end at 4:00 PM PT on the next month’s Evaluation Day. If you’re confused, I don’t blame you. Here’s an example to make it a bit easier to understand. Let’s say you open your account on January 12, 2019 with $1,000. Your first Evaluation Period would run from February 1, 2019 through February 25, 2019. Your first Evaluation Day would be February 25, 2019. To keep the Upper Tier interest rate, you’ll need to either have an end-of-day balance of $25,000 on February 25th, 2019 or have made a $100 deposit during the first Evaluation Period of February 1, 2019 to February 25, 2019. 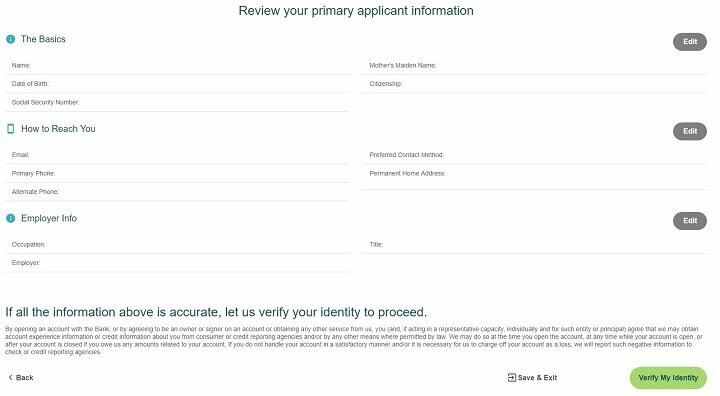 Note: Your first Evaluation Period does not begin when you open your account. If you make a $100 deposit before the beginning of your first Evaluation Period, it will not count toward the minimum $100 deposit requirement for your First Evaluation Period. CIT Bank’s fee schedule is pretty awesome for most banking customers. They don’t charge a fee for outgoing wire transfers if your account has an average daily balance of $25,000 or more, but they do charge a fee of $10 per outgoing wire transfer if your average daily balance is less than $25,000. To open a Savings Builder account, you must have a minimum opening deposit of at least $100. This $100 or more initial deposit does not count toward the qualifying deposits to earn the Upper Tier interest rate for future Evaluation Periods. The opening minimum balance is a good test to see if you’ll use the product to its maximum potential going forward. If you have trouble scraping together $100 to make the initial deposit, you may have a hard time qualifying for the Upper Tier rate on a regular basis. When I saw CIT Bank’s Savings Builder interest rate, I quickly realized it was higher than I was earning in my other online savings account. Then, I saw CIT Bank raise the rates offered and I knew I had to try the product out. Normally, I don’t rate chase for the highest interest rate bank account. Small differences in interest rates of 0.10% or 0.20% don’t make a huge deal unless you have a massive savings account, which I sadly do not. 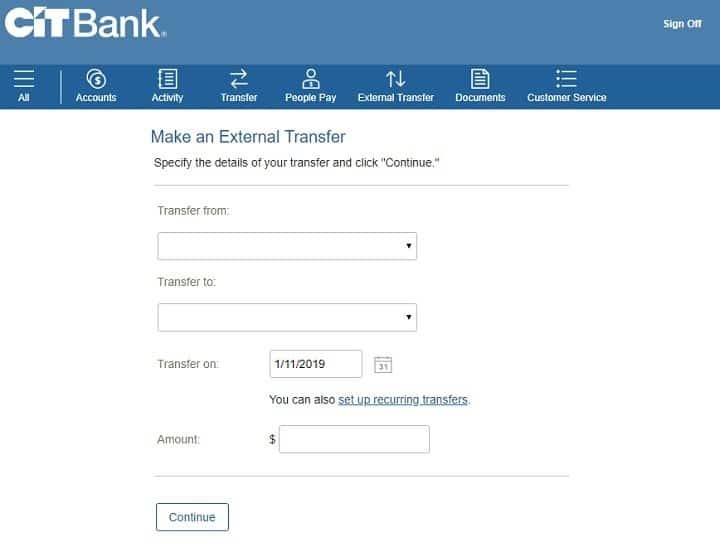 Once I realized that CIT Bank was serious about keeping their Savings Builder account a top contender when it comes to interest rates, I knew opening a Savings Builder account would be a smart move for my family. CIT Bank’s Savings Builder account has a ton of potential uses that really excite me for both myself and my readers. First, Savings Builder is the perfect account to use if you’re just getting started building your emergency fund. The $100 deposit requirement to earn the Upper Tier rate should motivate you to keep growing any size emergency fund. It helps your emergency fund grow by getting you a higher interest rate and by adding to the account on a regular basis. CIT Bank’s customer service can be reached in two main ways. 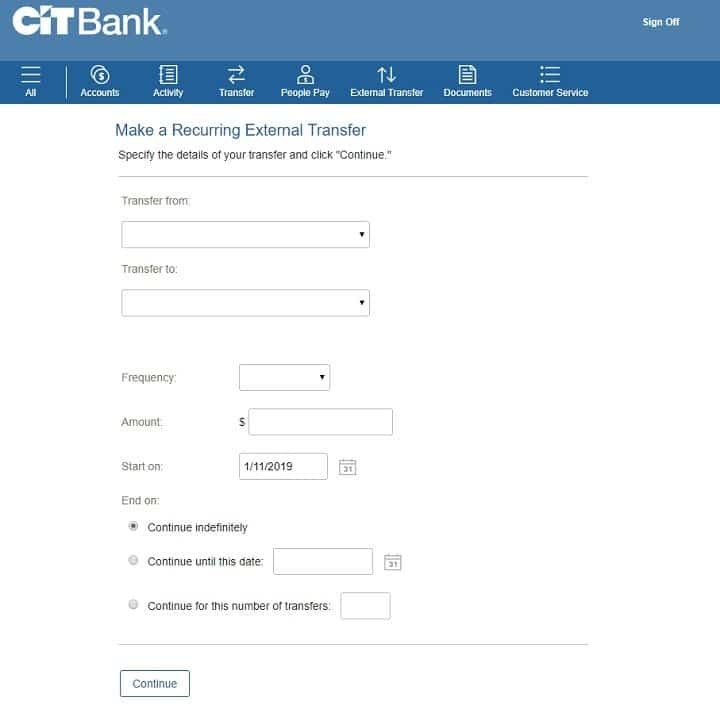 If you’re not in a rush, you can send CIT Bank a message through your online banking. They typically respond in one to two business days. 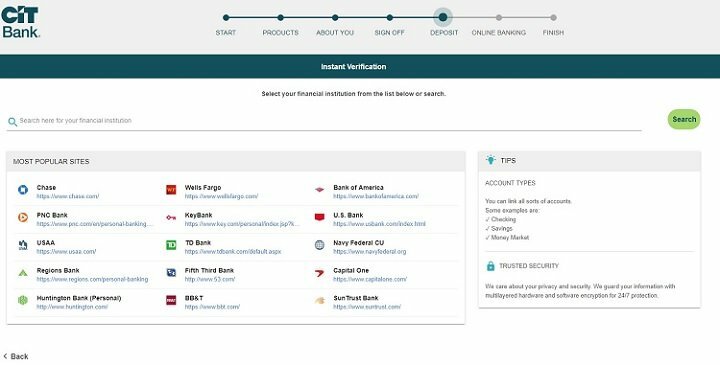 I recently opened a Savings Builder account and took screenshots of the process to show you how it works. Keep in mind, the below screenshots are accurate as of when I opened my Savings Builder account in December 2018. Additionally, the screenshots below only follow the process for the specific options I’ve chosen. Your process may be different. I have redacted my personal information in certain screenshots. If an area is blank where text should be is blank, that’s why. In my case, I selected “I am a new customer”. 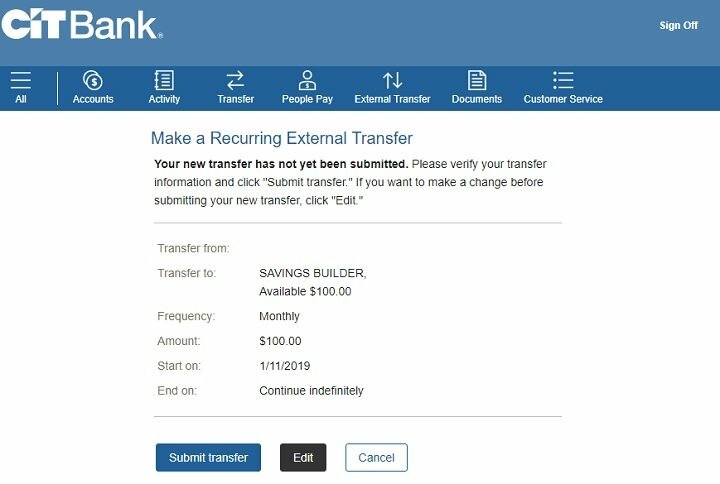 Once you open your Savings Builder account and log in for the first time, I highly suggest you set up an automatic monthly transfer of at least $100 per month. I decided to set mine up on the 11th of each month so it fell in the middle of an Evaluation Period. 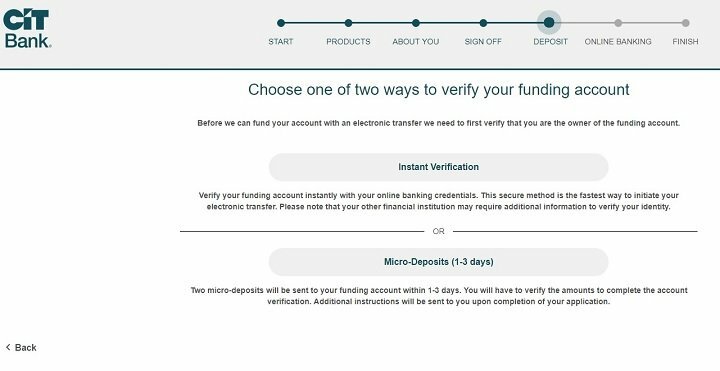 Here’s how I set up an automatic monthly transfer after I opened my account. CIT Bank Savings Builder accounts are an amazing option for people looking to build a habit of saving on a regular basis and those that have $25,000 or more to leave on deposit at CIT Bank. The Upper Tier interest rate CIT Bank offers on their Savings Builder accounts is usually one of the best available, allowing the money in your account to grow faster. The offer was so tempting I opened an account myself. I’m glad I did and hope to continue enjoying CIT Bank’s Savings Builder account for years to come. If my opinion about the account ever changes, I’ll be sure to update this post as soon as possible so you’re always getting my most up to date thoughts on this product. This review is editorial content and is solely my honest opinion of the product and service. 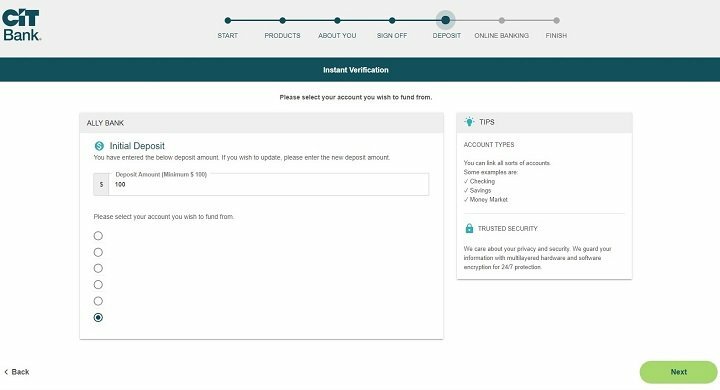 It is accurate to the best of my knowledge as of January 11, 2019, but you should read the terms and conditions on CIT Bank’s website as those details, not the ones listed on this website, are the ones that govern your relationship and your accounts with CIT Bank. The post CIT Bank Savings Builder Review – Earn More Interest on Your Savings appeared first on cfd trading tips blog.